Disney’s Memory Maker can now be added to your Walt Disney World vacation package. No need to worry about pre-purchasing in time to get the pre-purchase price. *As part of your package it will be subject to Disney’s package terms & conditions & cancellation policy. “Memory Maker” combines photos taken by the PhotoPass photographers, attraction photos and any of your own photos linked to your My Disney Experience account. Photos will be available the day they are taken and can be accessed for 45 days. Photos can be downloaded an unlimited amount of times during your stay and for 45 days after. 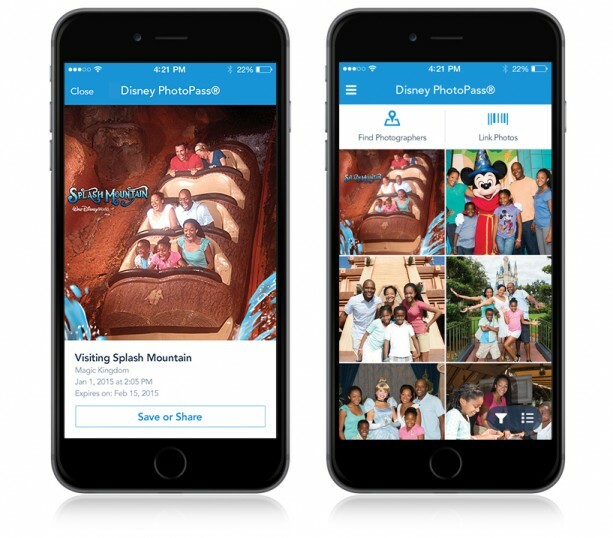 With the addition of Disney PhotoPass on the My Disney Experience mobile app, you now have easier access to your Walt Disney World® Resort memories. The new update allows you to preview all your Disney PhotoPass vacation photos, including photos from select attraction and dining locations. Plus, you can now purchase Memory Maker within the app, allowing you to share and download your vacation photos right from your device. Forget about having to purchase each photo individually—you can get digital copies of them all. 1. Link Memory Maker to your My Disney Experience account. If you purchased online, it may have been linked automatically. 2. Add people to your Family & Friends list to enable you to view and download their photos. 3. Capture unlimited photos at hundreds of Disney PhotoPass locations—and select attraction and dining locations—throughout Walt Disney World Resort; as well as attraction videos at select locations. 4. View and download your photos. Once you download the first photo, you have 30 days to capture more photos. Photos remain in your account for 45 days after they are taken. Where can you use my Memory Maker? Disney PhotoPass photographs set up throughout the Walt Disney Resort to capture your magical memories. You will need to watch for these photographers & ask them to take your photo or get in line for a photo if their is a line. Memory Maker, attraction videos. Disney is now offering attraction videos. The are currently offered in the Magic Kingdom at the Seven Dwarfs Mine Train and in Hollywood Studios at the Tower of Terror attraction. These videos are automatically added to your Memory Maker account by detecting your MagicBand while you are on the ride. Animated Magic Shots. Add a little animation magic to your family photos with these new animated magic shots Disney offers. You can ask for them in Epcot® – Behind Spaceship Earth and at Norway Pavilion; in Disney’s Hollywood Studios® – Hollywood Boulevard and in Disney’s Animal Kingdom® Theme Park – Bridge near Expedition Everest. Photo Booths – NEW in 2017 Disney has some little photo booths places around the parks & resorts. There have been reports of booths in Animal Kingdom outside of the Primeval Whirl attraction, in Magic Kingdom outside of Space Mountain & on the Boardwalk at the Boardwalk resort. When you see one of these booths, climb on in & make a silly face or two. 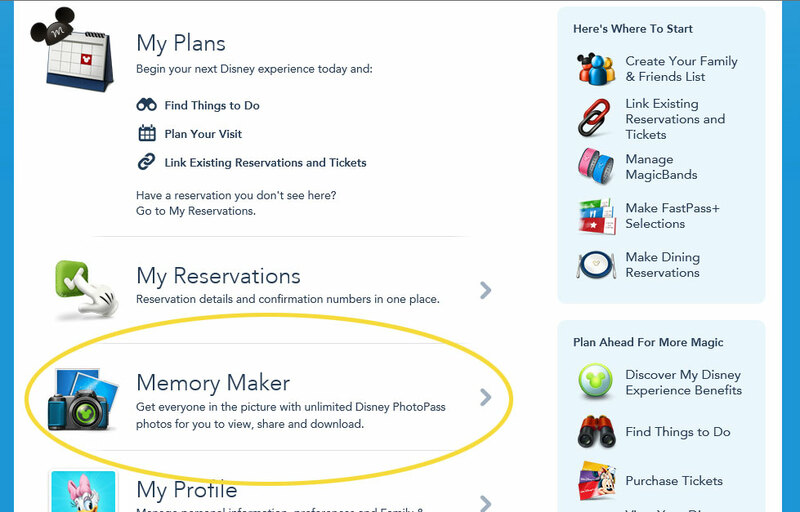 Then touch your MagicBand & select the MagicBand option to record your photos in your Memory Maker account. With Memory Maker, your whole family can be in the picture, and even video, at Disney PhotoPass locations—plus select attraction and dining locations—throughout Walt Disney World Resort. All of the photos you take are magically yours forever, like memories of your family posing together in front of Cinderella Castle, screaming down Splash Mountain, hugging Mickey Mouse and so much more. In addition to attractions you can take advantage of Memory Maker at special event excursions such as the Pirates and Pals Fireworks Voyage, Escape to Walt’s Wilderness and Culinary Adventure at the Contemporary Resort. Special Shots are offered at events such as Mickey’s Not So Scary Halloween Party. Click HERE to read more about the Halloween Party Photos. The normal purchase price is $169. If you buy at least 4 days in advance of your trip you can save $20. Your Memory Maker window will begin 3 days after the date Memory Maker is purchased. All photos taken outside of your Memory Maker window must be purchased separately. As of 12/15/15 Disney is now offering a Memory Maker One Day Product. The one day entitlement is available for purchase in the My Disney Experience mobile app only. This allows you to enjoy the benefits of Memory Maker for one day at any of the Walt Disney World theme parks. This can only be purchased before or during your vacation and only if there are Photopass photos present in your account. The cost is $59. To purchase your Memory Maker have your travel agent add it to your package or go to your account at www.MyDisneyExperience.com Sign in, scroll down & click “Memory Maker” then follow the instructions. If you do not have a My Disney Experience account, go to www.StartYourDisneyExperience.com to sign up for your free account today. Let me help plan the details of your magical adventure! • Receive a welcome packet when you book, with information & a custom planning calendar. • Dining reservation assistance. Help with your dining reservations (based on availability) at time that won’t interfere with your touring. • Fastpass+ assistance. Which attractions are the best for your family to utilize your Fastpasses for and assistance making those reservations (based on availability). • Itinerary plans and detailed itinerary with added suggestions to optimize your day and your experiences. • Help planning visits to other area attractions outside of the Disney theme parks. Thank you for reading. My name is Melissa and I am a travel agent. You can find me with my family in one of the Disney World Parks almost every weekend. I am always keeping up with all of the new things that Disney World offers & have countless hours of personal experience. If you would like help planning your next Disney World vacation, contact me for a free quote. All of my planning services come at NO additional cost to you. Email me or visit my website today to get started.